In response to the directives of the Chief Executive Counsel Communiqué of 2008 and FACSSO Resolution No. 13-1 of 2013 which aim at meeting Strategic Goal No. 3 of the Nation’s Strategic Development Plan (SDP), the Office of the Secretary of the Department of Education has been developing Career Guidance and Counseling materials for the high schools in the FSM. In addition to a series of activities regarding development of career and technical education in the nation and development of guidance and counseling materials, a Career and Technical Education (CTE) Training of Trainers Workshop was conducted at the National Special Education Office in Kolonia on May 19-23, 2014. The 41 participants included high school principals, counselors, CTE/VocEd and regular education teachers, SpEd teachers, VocEd and academic education counselors, and State CTE Coordinators. 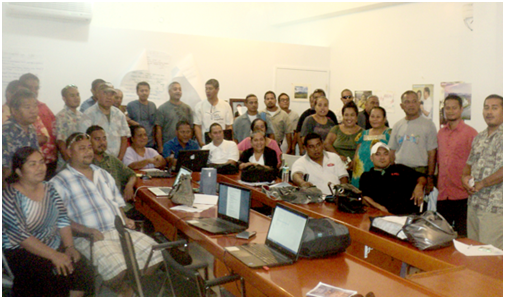 Other participants included representatives of the State DOE, COM-FSM CTE, WSD&T and the Bridging Gap Specialists for Chuuk and Kosrae. The focus of the workshop was to provide the participants the knowledge and skills to implement the High School Guidance and Counseling Guides for each state which included the following job-site guides; Job Shadow Guide for sophomores, Mentoring Guide for juniors and Practicum Guide for seniors. The participants were given the tools to conduct program and result evaluations. The Program Evaluation will measure how well each of the guides is implemented. The Result Evaluation will measure the impact of the guides on students’ achievement, attendance and behavior. Such results will be reported to the NDOE, the national leadership, the SDOE, the state leadership and other stakeholders in the FSM. And lastly, the participants practiced developing CTE lessons that are aligned with the FSM CTE Standards that are found in the FSM Career Education Standards and the FSM Career and Technical Education Standards for Secondary Schools.